Thinking about the varying needs of the customers, we offer large range of Metal Timing Pulleys. In any drive the pulleys and belts are of equal importance to get maximum output from the drive. We manufacture products using best quality material and latest techniques and machines. Our products are widely used amongst the customers for their effectiveness. 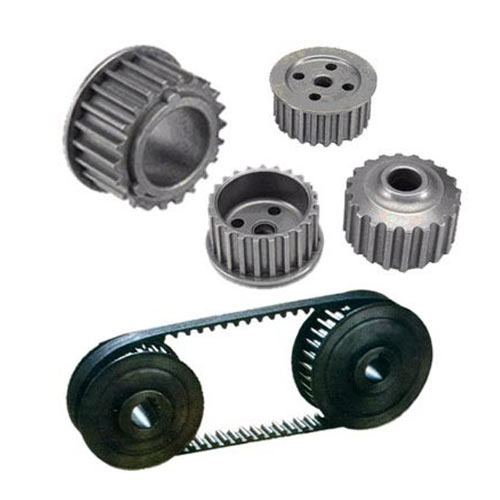 We are the leading manufacturer and supplier of a wide range of Metal Timing Pulleys in Coimbatore, Chennai, Tirupur, Pollachi, Trichy, Salem, Erode,Ooty, Madurai, Tirunelveli, Hosur, Krishanagiri, Vellore, Karur, Dharmapuri, Dindigul, Kanchipuram, Perambalur, Thoothukudi, Kozhikode, Kannur, Cochin, Allepy, Thiruvananthapuram, Ernakulam, Idukki, Malabar, Thrissur, Palakkad, Kottaiyam, Chittoor, Visakhapatnam, Hyderabad, Tirupati, Bangalore, Mysore, Tamilnadu, Kerala, Karnataka, and India. Sri Emm Emm Engineers is a well-known Manufacturer and Trader incorporated in the year 2007. We are a sole proprietorship concern, specialize in offering a broad spectrum of Polyurethane Belts, Industrial Belts, Conveyor Belts and several others. Our products are renowned amongst clients for their outstanding features and quality as we manufacture them using the high-grade raw material. Before using the material in the development of products, we thoroughly check their excellence on varied parameters. This helps us in developing quality approved range. Our products are manufactured in accordance with the suggested guiding principles of industry, which further assists us rising up as a leading name in the industry. Products offered by us are highly acknowledged among vast clientele for their features such as tensile strength, high mechanical efficiency, outstanding performance, long functional life and much more. Our timely delivery of products, cost effective solutions, ethical business policies and fair dealings have enabled us in becoming the prime choice of vast clientele. We are the leading manufacturer and supplier of a wide range of Belts in Coimbatore, Chennai, Tirupur, Pollachi, Trichy, Salem, Erode,Ooty, Madurai, Tirunelveli, Hosur, Krishnagiri, Vellore, Karur, Dharmapuri, Dindigul, Kanchipuram, Perambalur, Thoothukudi, Kozhikode, Kannur, Cochin, Allepy, Thiruvananthapuram, Ernakulam, Idukki, Malabar, Thrissur, Palakkad, Kottayam, Chittoor, Visakhapatnam, Hyderabad, Tirupati, Bangalore, Mysore, Tamilnadu, Kerala, Karnataka, and India.